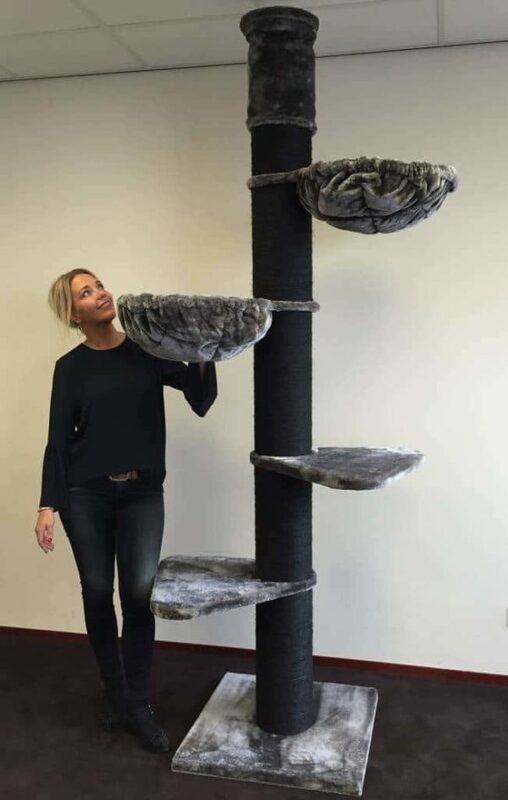 The Estaca cat tree not only provides your precious feline with an friend exciting environment for them to play and entertain themselves to their hearts content. But, has been styled beautifully to seamlessly blend into your homes décor and command centre stage in any room.. This truly is a work of art and if this was not made specifically for your feline friend then this would not look out of place in a luxury Art Gallery! The contemporary styling of the Estaca cat tree and the beautifully woven sisal wrapped scratching posts have combined effortlessly to create this marvellous, stunning piece of kitty architecture! There are several platforms the your feline friend to kick back and relax, each of which include a cosy, plush covered cushion which feline friend will simply melt into. If all this wasn’t enough to inspire your kitties imagination, they can also take themselves off inside the woven kitty clubhouse which also includes another (machine washable) pillow for them to curl up and have a peaceful catnap.